India’s largest private radio network 93.5 RED FM celebrates Eid al-Fitr with the launch of its new radio station in Srinagar- City of the Sun. 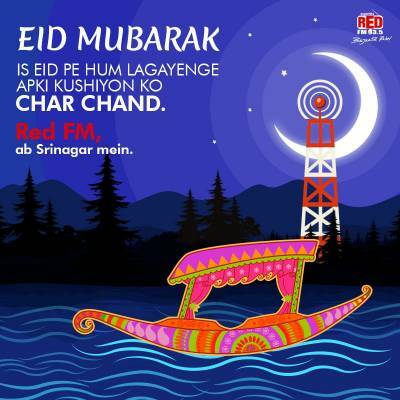 RED FM continues to strengthen its presence in the North market. As a part of the phase III expansion RED FM launched its station today, aligned to the brand philosophy and attitude that is ‘Bajaate Raho!’. The station will have CHR (Contemporary Hit Radio) format for the city, playing Hindi superhit music. Speaking about the station expansion, Nisha Narayanan, COO, RED FM said, “RED FM’s constant effort has been to create meaningful and innovative content formats for everyone. We have been waiting to enter Srinagar for a long time now and we intend to bring our entertaining intellectual properties to this market. The team has invested a lot of time to create the content for this market, keeping in mind the sentiments of the listeners. Having said that, the entry into such sensitive markets is a major step for the growth of FM in India. The new station launch is going to be more than just music and aims to create a strong emotional touchpoint for the citizens.